Attorney Jerome F. Buting offers a compelling in-depth look at dysfunction within the American criminal justice system, interweaving his account of the Steven Avery trial at the heart of Making a Murderer with other high profile cases from his 35 year criminal defense career, and lays out a provocative, persuasive blue-print for reform. Not since The Thin Blue Line has there been a true crime saga as engrossing as Making A Murderer. Captivating audiences across demographic lines, it made Steven Avery a household name and thrust Defense Attorney Jerome F. Buting – and his fight against America’s dysfunctional criminal justice system – into the spotlight. 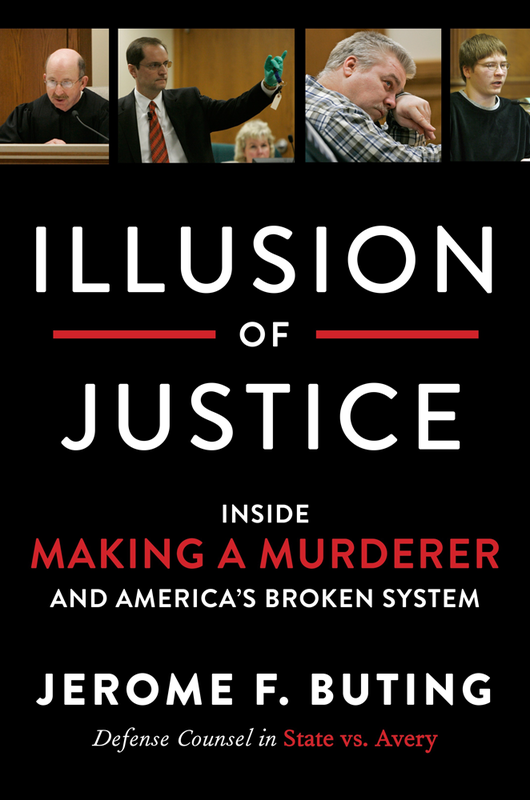 In Illusion of Justice, Buting uses the Avery case as a springboard to examine the shaky integrity of our law enforcement and legal systems, which he has witnessed firsthand for nearly four decades. From his early career as a public defender to his success overturning wrongful convictions, his story provides a compelling insider’s view into the high-stakes world of criminal defense, and suggests that while in principle the law presumes innocence, in practice it more often than not presumes guilt. Combining narrative reportage with critical commentary and personal reflection, Buting explores his professional motivations, the high-profile cases that defined his career, and the path to much-needed criminal justice reform. Taking its place beside acclaimed bestsellers such as Just Mercy and The New Jim Crow, Illusion of Justice is a tour-de-force from a relentless and eloquent advocate for justice who is determined to fulfill his professional responsibility – and, in the face of overwhelming odds, make the judicial system work as it is designed to do.